I closed out my racing season on Sunday October 14th 2018 by earning the Fiesta Island 20k Individual Time Trial Series Championship in the challenged athletes category which includes cyclist’s that pedal with their legs not just arm powered handcyclist’s like me. The series consisted of 5 races thru out the year. I raced in all of them not an easy thing to do considering other races in and out of the state of California where I live, life commitments, responsibilities, and trying to maintain life balance. Performing at this level takes a lot of hard work, dedication, sacrifice, blood, sweat, and tears. Countless hours go into very intense training every single day all the hard work is done behind closed doors. Most only see the end results and they are podium finishes and consistent improvement on my performance. I always dedicate the hard work and race results to God, family, team, anyone who whole heartedly supports me in addition to anyone who has been told they can’t or has a disability. All of the hard work in training, racing, and traveling to races is in preparation for the ultimate goal of making Team USA and representing everyone at the Paralympics. I would like to mention and thank my sister Claudia who came out with one of my nephews to support and cheer me on. 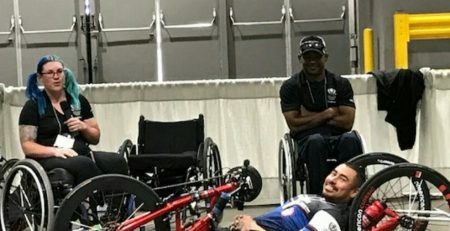 Special shout out to my friends and fellow adaptive athletes Mathew Rodriguez from Steven Peace Cycling Team and Emanuel Herrera aka Manny from Paralyzed Veterans of America Racing Team. Who stuck around and cheered on at the podium.